This update includes a new quest line focused on a gold rush in Springfield. 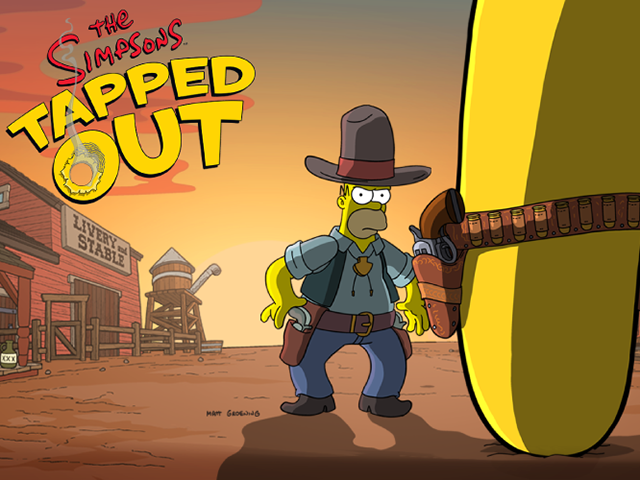 EA Mobile launched the latest content update in The Simpsons: Tapped Out, allowing players to transform Springfield into the Wild West. This update includes a new quest line focused on a gold rush in Springfield, and it allows players to construct the free Town Plaza in their town. Players can assign certain characters to jobs at the Town Plaza to earn one of two resources: Pickaxes or Hats. Users can decide which resource they’d like to earn before assigning characters to the building. As players collect Pickaxes and Hats, they can trade these in for Clues at the new General Store building. Players have access to three Clue bundles at a time, which cost different amounts of resources to purchase. As players purchase Clue bundles, they’ll receive themed prizes, such as a Cactus Rock, Hitched Horse, Frontier Fence and more. Meanwhile, as players collect Clues, they’ll earn prizes like the Bank and Top Chop Barber Shop building, Pickaxe and Hat bundles and the Gummy Joe character, among others. This event is split into three timed Acts, each with different prizes to win. Players must collect specific prizes before an Act ends to unlock the Story Finale for the Act. Elsewhere, gamers can collect extra event resources by tapping on Bandits around their town. These Bandits may hide in buildings, so players may need to tap on certain buildings to bring the Bandits out into the open. In addition, the update allows players to collect Prospectors and send these to their friends’ towns. Gamers can tap on Prospectors in their own town to earn extra resources. Finally, players can purchase Wild West-themed items in the game’s store. These items include a Wild West Film Set (which generates Bandits), the Wilted Rose building and more. Gamers can also place free dirt patches and dirt road squares around their town. These can be placed in the same way users place regular road or pavement tiles. The Simpsons: Tapped Out is available to download for free on the iTunes App Store, Google Play and Amazon Appstore.